In this lecture, Julian Earls, Ph.D., will discuss Some Things They Don't Teach You in College. Earls is Executive in Residence and Senior Advisor to the President of Cleveland State University (CSU) in Cleveland, OH. He chaired the projects that established the Campus International School and the MC2STEM High School on the CSU Campus. Both are schools in the Cleveland Metropolitan School District. He is the retired Center Director of the NASA Glenn Research Center (GRC) in Cleveland, OH. GRC is engaged in research, technology and systems development programs in aeronautical propulsion, space power, space communications and microgravity sciences in combustion and fluid physics. He managed a budget of $750 million and a workforce of 3300 employees. He holds eleven university degrees: Bachelor’s in Physics; Master’s in Radiation Biology; Master’s and Doctorate in Radiation Physics, and seven Honorary Doctorates. He also is a graduate of the Harvard Business School. Dr. Earls is the author of 31 publications and has received Presidential Rank Awards from President William Jefferson Clinton and President George W. Bush. He has received three NASA Awards for Outstanding Leadership, Exceptional Achievement and Distinguished Service. 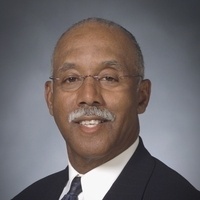 He received Distinguished Alumni Awards from his undergraduate university, Norfolk State University and the University of Michigan, one of his graduate schools.